Mr. Wonderful may come off as "the mean shark" — but he says he's doing budding entrepreneurs a big favor. When "Shark Tank's" toughest shark, Kevin O'Leary sees a bad idea he knows will fail, he doesn't sugar coat his opinion — at all. He often says, "Take that idea behind the barn and shoot it." That straightforward response and attitude stems from a personal golden rule O'Leary is fiercely proud of: honesty. He believes that honesty is the key factor to his success — even if his sometimes harsh opinion leads to some tears (and broken dreams for budding entrepreneurs). 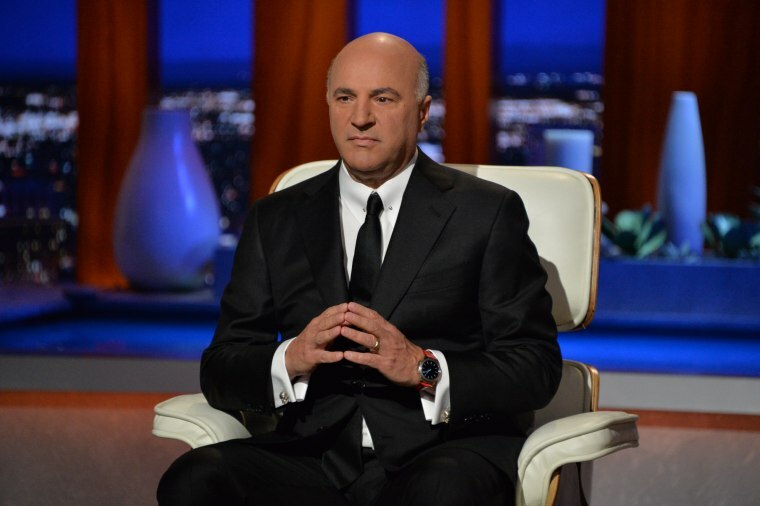 O'Leary says "entrepreneurs have to learn that not everything works, and I'm there to tell them the truth. That's why I they call me Mr. Wonderful." One of Mr. Wonderful's most notable entrepreneurial ventures began in 1986 when he founded SoftKey Software Products, (later renamed The Learning Company) — an educational software for children. The biggest splash for O'Leary happened in 1999 when Mattel Inc. acquired The Learning Company for over $4 billion dollars. Since the Mattel acquisition, O'Leary has been keeping himself busy — and has created a successful brand for himself. He's written three books, continued to invest in companies and has even launched several of his own with his name attached to them — O'Leary Financial Group, O'Leary Funds and even O'Leary Wines. NBC News BETTER had the opportunity to chat with Mr.Wonderful about the importance of honesty, business and life on "Shark Tank." On what it's like to be the "mean Shark" on "Shark Tank"
Everybody calls me the mean shark on "Shark Tank." That's not true. I'm the only shark that tells the truth. In money, it's just black and white. Either you make it, or you lose it. So you might as well deal with the truth right from the get-go. If you're doing something that's going to go bankrupt, why not deal with it now, and start something else that maybe will be successful? Everybody asks, "Why are you Mr. Wonderful?" And the answer? Because it's true. On learning to be a "tough guy"
People ask me all the time, "Why are you so tough? Did you learn that?" I said, "No. It's just dealing with the truth all the time." In business, you've got to deal with the truth. You can't make up stuff, it just happens to you. Reality always comes and bites you in the heinie, so why not deal with it from day one? The truth is what's important, not the fake sides of things. Because you're always telling yourself, "Things are gonna work out." When in reality, sometimes they don't. Deal with it. Get over it, pick yourself up off the floor, and start again. That's what entrepreneurship is all about. Deal with it. Get over it, pick yourself up off the floor, and start again. That's what entrepreneurship is all about. I've got all kind of people working for me, and I always tell them the same story. Love is like business. Marriage is like business. And here's what I mean. When you first fall in love, and you fall in trust with somebody, it's a magical time. You go to that relationship fully in lockstep with each other, because you trust each other. Then that time comes, as it often does in relationships, years later, when somebody breaks that trust. Now what do you do with it? Do you lie to your partner, or do you come out and tell the truth? 'Cause the truth always comes out. And when that happens, the first time you cheat in love or in business, you lose 50% of the equity of that relationship forever. You can never get it back. You may keep the relationship, but it'll never be the same. Remember that when you're cheating. 50% gone forever. You know, when I see an idea I really hate and I know it's going to fail, I often say, "Take that idea behind the barn and shoot it." I want to be graphic about it. It's like Old Yeller. You got rabies, your idea's going to die, you might as well kill it and be merciful, and go do something else. Taking it behind the barn and shooting it is the right thing to do. And I don't care if they cry about it. I'm still giving them really good information. All the other sharks are trying to keep their feelings inside. I don't care about your feelings, I care about your money. The truth is what matters in business. Yes, you have to take it behind the barn and shoot it.